If you have been following this project you will know that I am attempting to develop a mod for the popular video game The Elder Scrolls V: Skyrim. The mod is meant to be educational – but not in a conventional sense. I want people to play it and not feel like they are being forced to learn something, rather for people to play it because they want to and in the process of the game realise that there is something useful here. For more information on this project and its background check out my initial post, my set at Science Showoff and also where I am hosting the project over at Dark Creations – with a detailed project outline. I have now completed the initial mapping of the province of Skyrim in the continent of Tamriel. I did this using the immensely helpful UESP map which details the locations of the major types of ore veins to be found in Skyrim. The most common ore veins (in order of abundance) are iron, corundum, ornichalcum, quicksilver, silver, moonstone and malachite. Malachite unfortunately barely even occurs on the UESP map as it is found in so few places, so I have not included it in this map. The map here is very rough. It is hard to get accurate locations from one map to another, but I have tried my best. This means that every location is likely to be relatively inaccurate. In addition, because of the nature of geologically mapping a hypothetical location, there is not much possibility of identifying ‘contacts’ between different rock types. Why are ‘contacts’ so important? The location that two or more rock types are in contact with each other is crucial for mapping in the field. It is through identification of contacts between rocks that geologists are able to define where a body of rock is below the surface. In nature you will see exposures of rocks at the surface – when you are walking along and you see some rock sticking out of the grass that is obviously part of the hill you are walking on, or a road that has cut away at the rock around it. These rocks don’t just occur there though. The rock goes below the ground where you can’t see it, and the purpose of geological mapping is to find out where the rock is below the surface. If you know where the rocks are below the surface this is one of the keys to understanding how they got there. To do this requires an understanding of the type of rock you are looking at – is it hard or soft – which will determine whether you are likely to see it on a hill or on flat land. Contacts between one rock and another provide definite boundaries that you can mark off on your map and are one of the most important pieces of information for geologists in the field. We can’t do this on the Skyrim map because 1) it is imaginary 2) the scale of the maps means that this kind of observation is difficult 3) I am not going to spend hours and hours in Skyrim looking at rocks and veins which ultimately, because it is imaginary, won’t have a beautiful contact visible there and 4) I would rather spend my time in Skyrim plundering ruins, killing dragons and doing cool quests. And of course,when I come to develop a storyline around the geology of the area, the geology will need to be simplified – and because this is a game and imaginary I am allowed a certain amount of creative license! I have grouped where one or more ore locations of the same type can be found into ‘blobs’ that you can see on the map. Each blob is colour coded to represent a specific ore. Above is the map I have created with the locations of various types of ores (blobs drawn on over the coloured contour map). It might be difficult to see, so I recommend clicking on it and trying to zoom in. Unfortunately, when you get to this level of detail on the map of Skyrim, there is less consistency in the geological data. However, this was to be expected. 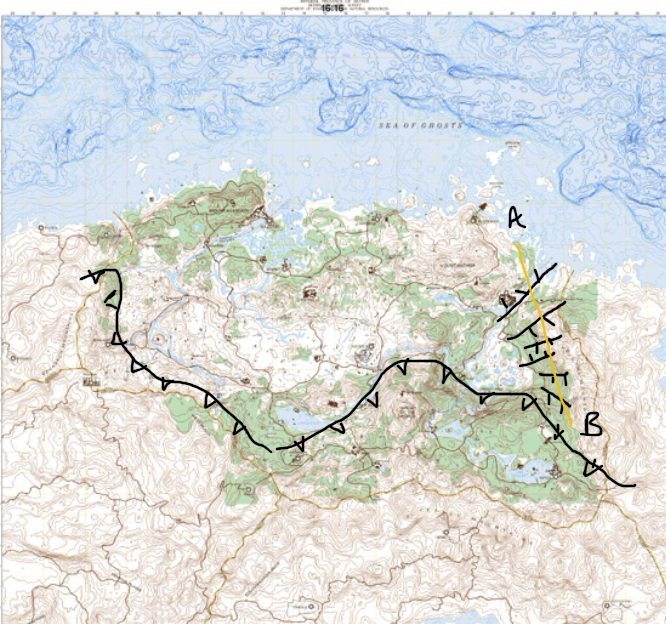 What I now aim to do is open this project up a bit to other geologists out there who I know are interested in mapping Skyrim. I would like to call on your expertise to come up with hypotheses about the geological evolution of Skyrim. 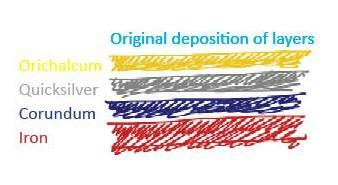 I am going to leave you the option to try to come up with something highly accurate, or to use your own artistic license in interpreting this geology to develop a hypothesis that makes sense but also includes some fun and interesting geological processes. I will not determine how the particular rocks/minerals mapped here were formed, because I would like to leave this open to geologists’ own interpretations. Leave your ideas in the comments below (or you can always email me at janeliz.robb at gmail.com) and I will collate them together and see what I think would be most suitable for making into a storyline for a new quest in Skyrim. For this, I will take into account the simplicity of the geological evolution if the area – I want to make something that is simple and easy to create a geological map of and that allows the creation of a viable new mineral that can be mined. Once a final hypothesis has been determined, I will write a post that describes this in a simple way for others who don’t know about geology to keep up to date with the project. So, have a bit of fun with it and let me know your ideas! I was trawling through Twitter during my lunch hour the other day and came across a random blog on fossils by an amateur palaeontologist (I forget which blog, apologies) and it suddenly occurred me: in how many other sciences can you have people who call themselves amateurs? In geology, amateur collectors, fossil hunters, palaeontologists, mineralogists, petrologists (probably not volcanologists though) are commonplace, and it is perfectly acceptable to be a respected member of the geological community as an amateur – provided you get your facts right. The amateur community is very influential in geology, as collectors often have important specimens that would be extremely useful to professionals or museums. And yet, I had never really thought about how in other sciences you don’t generally find amateur physicists, biologists, chemists and so on.Being an amateur in these professions is regarded less highly than an amateur geologist and generally classed as more of an interest rather than ‘amateur’. It may seem like a pretty minor observation but I think it hints at something bigger, an accessibility associated with geoscience that doesn’t exist so much in other sciences. Not because other sciences are less interesting or fun but because of the nature of the work involved in becoming part of the profession is more difficult: its easy to go rock collecting in your spare time using a notebook, rock hammer and hand lens (even a microscope if you happen to have one) to find out about the geological history of an area but accessing chemicals, a hadron collider (OK, a bit excessive) or dissecting animals are not household activities. Geology is easy to pick up and get excited about. You really can’t get away from it no matter where you look, buildings made of stone (or derived from rock materials), landforms defined by the rocks and structures under your feet – even the vegetation you see is defined by the type of soils that it grows on, influenced by the rock’s chemistry. And of course there are fossils. Nothing is more exciting than finding your own little piece of preserved life from millions of years ago – especially if you are under 15! 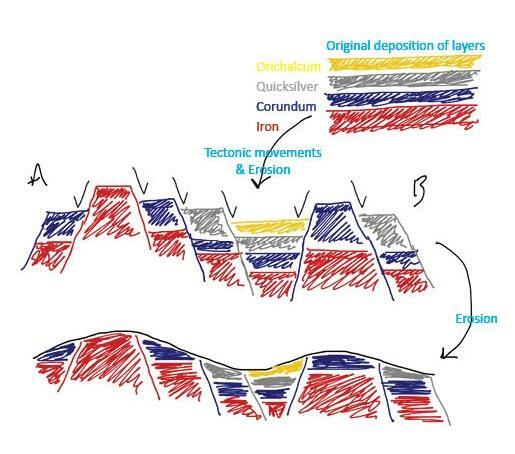 Getting kids into geology and becoming amateurs is incredibly easy because it can be a DIY discipline in many ways (not to understate geological research – which is essential and best left to the professionals!). 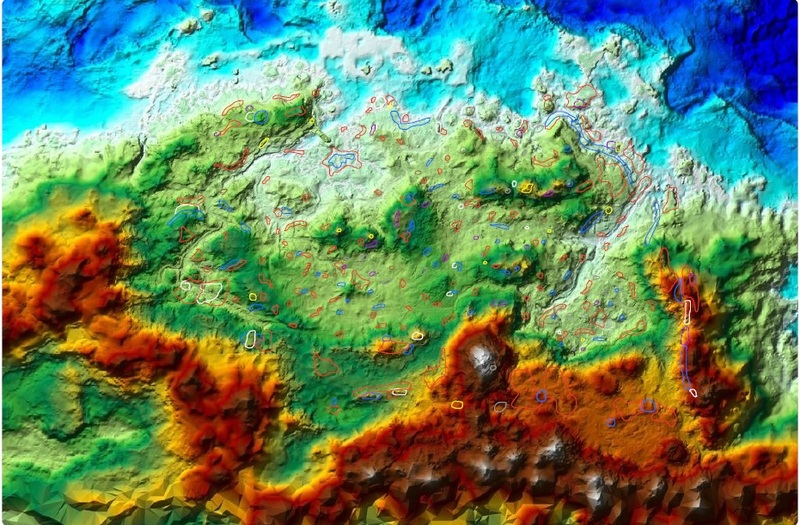 Dinosaurs, volcanoes and life on Mars are pretty much some of the coolest things to study and geology covers all of them! Even once you may have retired from the profession it is tempting to keep those collections you have had for so long and remain a collector who actively uses and researchers their collection. The problem with geology however is that it is not well enough known in the science arena. Not enough (high impact) science communication and public engagement connects broad audiences with geology, even with its fascinating hooks for many people. Although many kids will go through a stage of dinosaur-mania this does not always seem to last. Once you get older, I find that the engagement with geological sciences seems to trail off but pick up again when you become retired and like to go on ramblers walks or special interest groups. Why is this? I really don’t know, but it may be to do with the fact that geology is an amalgamation of lots of other sciences that have been applied to earth problems so when it comes to science communication it seems to get left out because it is not necessarily a science in its own right. Silly, when the fact that you have a set of sciences that are already applied to awesome situations like volcanoes and mass extinctions you could use this to teach about chemistry and physics as well as geology. Maybe also unfortunately the demographic is ageing when it comes to geological societies. I know of a few clubs/societies for young geologists (below 18) and many for adults (comprising mostly over 60’s) but there is little in the way of societies or public engagement for anything in between specifically aimed at geology – not including university societies as involvement tends to cease after graduation. Maybe the nature of the discipline in working for industry influences the amount of science communication in this area. Many who do a geology degree go on either to academia or industry meaning a high percentage of young graduates will be in commercial companies whose primary goal is to make money and not produce and disseminate knowledge like universities or other organisations. I definitely think there is more room for high impact (i.e. large scale multidisciplinary publications such as Scientific American, Nature Blogs, the Guardian etc.) geology communication, and would love to know if anyone does know of groups that are led by a large cohort of young geology professionals, and why there appears to be less exciting high impact geology communication out there. We have reached a point where everyone in the science sector is talking public engagement. It can be commonly perceived among more established academics as a ‘tick box’ type of scenario, where if you do some poster and a talk somewhere then you can get a big bag of funding for your next project. For others its something that they need to learn how to do to become academics, once again another ‘tick box’ situation and not necessarily something they really feel they need to do to become a researcher. For others it is a hobby, an interesting past time which with a lot of work and job applications can lead to a very interesting and rewarding career. What the last set of people maybe do not realise is that it’s not just the public that need told about public engagement. In fact, sometimes the academics themselves need a little guidance on what really IS public engagement anyway? Surprisingly, this was only something I realised very recently. I was having a conversation with a PhD friend of mine, who had also completed an MRes at the same time as me and gone on to further academic study while I ran for the hills and got a job. (At the same university. In the same department. Hmm.) As part of the doctoral training programme he is on it is compulsory to complete some sort of public engagement activity as part of his research. I thought this was great and said so, but he seemed rather confused about the whole business. For starters, what is public engagement? A totally valid question really. As he rightly pointed out, there is no such thing as the ‘general public’. Each individual could be a genius in something that just isn’t what you are talking about, and each person will have varying levels of understanding of science. Not to mention the many different ways in which people communicate and learn in the first place. How can you possibly be told just to ‘engage the public’ without some sort of clearer guidelines? So, what is the best way to decide how to engage this ‘public’? Taking my research project as a case study, I began writing articles about it in magazines. The magazines I chose were aimed at specific demographics, one was professional geologists and one was for young geologists between 3 and 18 years old. Already this is narrowing down how we can begin to engage these particular brands of ‘public’. The reason I chose these was largely dependant on two things 1) I knew the editors (quite important in terms of getting things published) and 2) I knew that these were two demographics who would not normally consider this particular topic in their daily work or interests. Others with the same research topic might have chosen magazines (or a totally different form of communication) to the heritage sector, for whom I have written articles for but not about my project. This was for two reasons 1) I felt that geologists needed to know what I had to say more than conservators and 2) I was bored with writing about my project. Importantly, thinking back to my post on why people communicate science, this is an entirely subjective choice. My aim was to start people thinking about an area of science and expertise they might not normally consider and to open up already scientific minds to the wider heritage associations of their subject area. (It could be said that I was trying to communicate culture to scientists.) I also felt that the biggest impact of my research would be to those who use and care for geological collections the most, and so professional geologists are the primary stakeholders of the research project on social values associated with geological collections. It therefore made a lot of sense to get this demographic on board with my research as much as possible. Although this last reason was a secondary consideration, it is important to think about why you need to do public engagement and what you can get out of it. When getting down to writing the actual article, thought needed to be put into what aspect of the project I was going to address. To attempt to cover the entire project including the background to the subject area and resulting research questions, the particular methodology and why it is so innovative and the intended conclusions is not advised in these circumstances. When I think about ‘engaging the public’ I think about what this person wants to find out the most. What might make them tick? Why have they signed up to this magazine in the first place? Once I feel I know that, I begin to work backwards. Lets start with what we can assume they know about geology and geological collections (usually erring on the side of less rather than more in most cases, apart from in the case of a professional society – you don’t want to go offending people). Then, more importantly, what don’t they know? Finally, how can I use my knowledge and research to fill in those perceived gaps and lead to a fuller understanding of the wider topic my research is addressing? Take, for instance, the issue of fracking. When I was working for the Scottish Earth Science Education Forum doing lessons and CPD courses for secondary teachers across Scotland on Carbon Capture and Storage, one of the common misconceptions I came across was that pupils AND teachers thought that oil came out of a big hole underground. They didn’t consider that we drilled down into rock, and oil is extracted from the tiniest of pores in the rock itself. They didn’t consider that actually we are doing something very similar to the fracking process, and have been for hundreds of years, when extracting oil. What I then hypothesise, is that this kind of assumption could be made by a lot more people, who might oppose fracking on principle because they do not understand the basic concept that oil doesn’t come of of a massive hole. The phrase ‘oil well’ might be a culprit for this kind of assumption. This doesn’t tackle the more pressing issues of whether we should frack, but it could be a simple solution to a lot of otherwise meaningless explanation of how it works if people have no idea how normal oil extraction happens. Coming back to the topic in hand, I use this type of process to decide on the message I would like to put across. Although it might not directly address what I am doing with my particular research project (which might be exceedingly boring to many) at least I can build the foundations of a wider understanding of a broad and complex topic. Going further back to the discussion I was having with my PhD friend, after taking all of this in he then asked: but why do we have to do it? Why can’t academics who are doing complex topics just get on with it instead of taking time to try to explain it to people who might not understand it anyway? For me, this is the ultimate annoying question. Because ultimately, I think that academics and researchers need to get off of their pedestals and remember that their hard work is for a purpose, and that is the greater good of society – however minor or abstract. This means that researchers need to ensure that what they are doing does actually benefit society in some way. Public engagement is called public engagement because it is not just an academic nattering on at ‘the public’ about their research trying vainly to get them to understand that the ‘moho’ is not a shortened version of a haircut, but the engagement it is an active dialogue between people from different disciplines in an effort to enhance each others lives and work. Oh. Says he, well in that case I’m already doing public engagement. I’m in the social sciences.